Remove rim from 9-inch springform pan; set aside. Place bottom of pan on sponge cake; use as pattern to trim sponge cake to fit inside springform pan. Reserve cake trimmings for snacking or another use. Reassemble springform pan. Place cake in pan; brush with jam. Bake 35 to 40 min. or until center is almost set. Run knife around rim of pan to loosen cake; cool before removing rim. Refrigerate 4 hours. Spread cheesecake with COOL WHIP just before serving; top with berries. 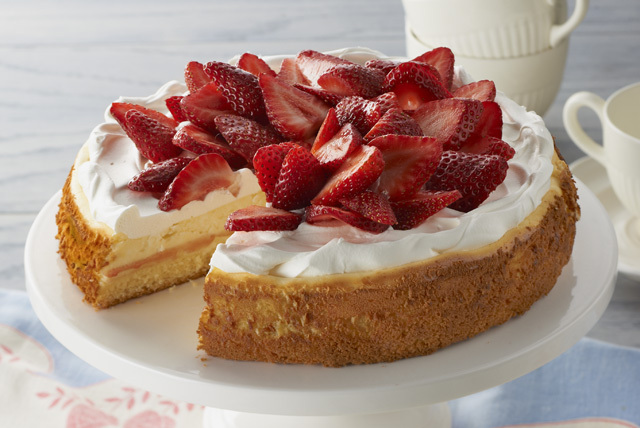 You'll know it's a special occasion when you get to enjoy a serving of this delicious cheesecake. Substitute 6 (1/2-inch-thick) pound cake slices for the trimmed sponge cake round. Arrange in single layer on bottom of springform pan, trimming slices as necessary to completely cover bottom of pan.